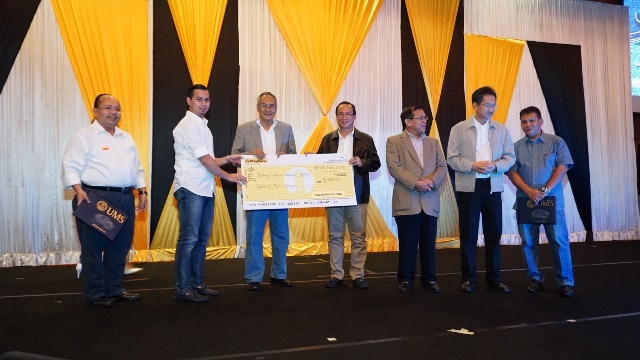 MONDAY, 28 MARCH – Universiti Malaysia Sabah (UMS) Alumni were urged to give back to the development of the university in various aspects for mutual benefit. Chairman of the Board of Directors of UMS, Tun Zaki Tun Azmi said that UMS alumni now stood at 52,120 who would be able to give back to the university not only in terms of industrial cooperation but also in the form of cash. “Leading universities such as Harvard University for example, has an endowment fund that has so far managed to raise US$32 billion in funds, donated by the alumni of the university. “Therefore, I advise graduates to respond and do your part for the university by contributing or donating to UMS for its development,” he said when officiating at the Homecoming Alumni programme held at one of the leading hotels in Kota Kinabalu, last Saturday. Tun Zaki also challenged UMS Alumni Association to hold a similar event next year in Kuala Lumpur and gather some 1,000 alumni who were there and also placing their fundraising target at RM1 million. Meanwhile, UMS Alumni Association President, Datuk Dr. Janathan Kandok said the association had collected a total sum of RM100,000. “A Special Committee Meeting on the establishment would be held on 22 March and had agreed on a donation of RM40,000 to UMS, not in the form of cash but infrastructure for the convenience of students,” he disclosed.